The most confidential part of knowledge is that one should become a pure devotee of Krishna and always think of Him and act for Him. One should not become an official meditator. Life should be so molded that one will always have the chance to think of Krishna. 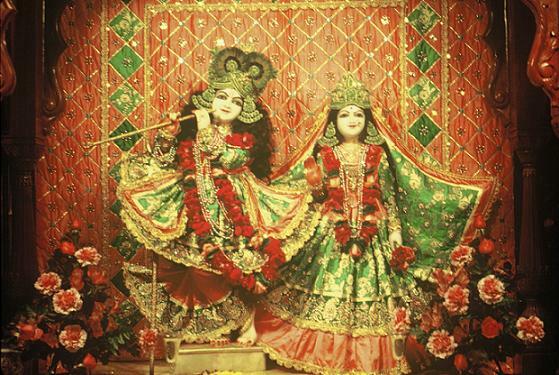 One should always act in such a way that all his daily activities are in connection with Krishna. He should arrange his life in such a way that throughout the twenty-four hours he cannot but think of Krishna. And the Lord's promise is that anyone who is in such pure Krishna consciousness will certainly return to the abode of Krishna, where he will be engaged in the association of Krishna face to face. This most confidential part of knowledge is spoken to Arjuna because he is the dear friend of Krishna. Everyone who follows the path of Arjuna can become a dear friend to Krishna and obtain the same perfection as Arjuna. These words stress that one should concentrate his mind upon Krishna -- the very form with two hands carrying a flute, the bluish boy with a beautiful face and peacock feathers in His hair. There are descriptions of Krishna found in the Brahma-samhita and other literatures. One should fix his mind on this original form of Godhead, Krishna. He should not even divert his attention to other forms of the Lord. The Lord has multi-forms as Vishnu, Narayana, Rama, Varaha, etc., but a devotee should concentrate his mind on the form that was present before Arjuna. Concentration of the mind on the form of Krishna constitutes the most confidential part of knowledge, and this is disclosed to Arjuna because Arjuna is the most dear friend of Krishna's.